Tips for Styling Bookcases and Built-Ins - Lovely Etc. Whew, the library shelves have been filled. And let me tell you, styling these babies was almost as much work as building them. (Though it was much more fun.) It was completely overwhelming facing 34 empty shelves surrounded by stacks and stacks of books and pretties. After spending several minutes paralyzed with indecision, I decided to just dive in and get started. 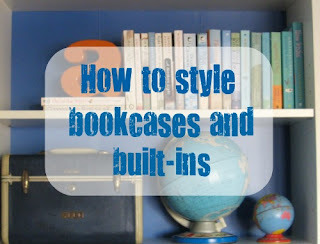 And I managed to come away with some great tips for anyone else looking to style bookshelves and built-ins so you will hopefully not be quite so overwhelmed. When dealing with a wall of bookcases like ours, I think it is important to create some type of focal point. This gives your eyes somewhere to rest. In my case, I created four larger shelves in the center and then styled them with larger eye-catching items rather than books. While I wanted my bookshelves to be pretty, I mostly wanted them to be a useful place that would hold all of my books. So that was the logical place to start. First I organized our books by genre – my fiction, my husband’s fiction, Christian nonfiction, etc. Then I started arranging the books on the shelves, spreading them out throughout the entire bookcase. I did all the usual things to prettify the books as I went – removed dust jackets, grouped by color, arranged by height. Books and bookcases are naturally rectangular and full of hard lines. Adding lots of round or flowing lines helps balance all that harshness. I used lots of circles when styling my own bookcases. Other great curvy items include vases, plants, shells, and baskets. Bookshelves always look more interesting with some books shelved vertically and others stacked horizontally. But there are also other ways to add a little pizazz to your books. I displayed a few books with their covers facing out, bookstore-style. I also grouped together sets of books in trays, baskets, a tool caddy, and a repurposed clarinet case. I had a bunch of big fat mass market paperbacks from many years ago. I wasn’t ready to let those books go but they were definitely not looking so hot. So I hid them away in some cute vintage luggage. Now they are still in the library with the other books but are out of sight. This is my favorite part. I love unique, vintage, and handmade items so that is what I focused on. And I can proudly say that the only thing that was bought new during this styling process was a command hook to hang my book page wreath. The library is really coming together now – the only problem is each time I complete a project I feel like everything else that was going to be in the room looks bad in comparison. Which leads to a whole slew of new projects. Luckily I am okay with that. As always, I would love to hear what you think. Just so you know, I read each comment (usually with a big dopey grin on my face) and try to respond to each one. You guys totally make my day. Hope you have a great weekend! Carrie… WOW!!! This looks fabulous! What a great job you did, it look perfect. I’m really into the vintage luggage & globes. The display is a masterpiece – I just had to pin it! Have a great day! Great post!!! Yours looks great! Carrie, It looks great! I like how you broke it down to make an overwhelmimg task into something fun and managable. I love the vintage suitcase for the books. I also have a typewriter that I display with messages “typed” in…it’s fun to change the messages for different occasions! It looks wonderful! Nice job ~ I can’t imagine how overwhelming all of those shelves must have been. Love the globes and the wider/taller shelves in the middle! I do the same thing, except I have to admit i didn’t do as good a job last time. Note to self: move things around a bit more. Your bookcase look pretty, but all mine are full—of books! They’re organized by subject, except for the fiction books. I put all novels from the same author together. I don’t have space for decorative items on the shelves. And, no, I won’t give up my books! Awesome! I had to pin it too! I’ll be putting together a small section of built in’s soon, so I was thrilled to see your beautiful job. I love the idea of making a focal point. Good stuff! Great suggestions. I think I’m ok with the books part, it’s the accessorizing part where i start to get paralyzed. I took my mass market paperbacks (I’ll admit it, trashy romances and mysteries) and lined them up spines-in on my kitchen mantel, perfect solution. It gave lots of texture without shouting the titles (which would have been pretty embarrassing). Love this post! I’m going to take a second look at the shelves my husband built in our bonus room. Do giant foam dinosaurs and matchbox cars count for interesting shapes? :-) I’m your newest follower! great tips! I really need to tackle the built ins in my office! Thanks for sharing! i REALLY enjoyed this post- the picture of everything assembled instantly caught my eye, but now that I’ve read everything I really appreciate your perspective on how to style everything. That process totally makes sense- starting with books- mixing things up with how to display them, then adding things with different shapes. This is so helpful. LOVE that shade of blue too. It adds a great pop of color. Thanks so much for sharing!!! Ah-mazing! You are inspiring me to redecorate my bookshelf. I’m following. Stop by http://www.thenymelrosefamily.blogspot.com any time. Thanks for sharing. What a great post! I wish I had that many bookshelves. WOW! WOW!! Your bookcases look amazing!! I love the styling!! I would love to have these bookcases. This is a GREAT tutorial! I’m lousy at things like this, so I always look for photos to help. :) You have a lovely lovely blog and I am so excited to be your newest loyal follower! Great tips for pretty and organized bookcases! Great Work and Idea for keeping books save. Thanks for this! Already have the bookcases separate and have been wanting to do something like this! Thanks to you, now I know how. Carrie, these look fabulous! Where did you get such an amazing set of shelves, and did you do them over? Thanks! They are from Ikea…and yes you may have noticed I have since stenciled and repainted them to lighten things up. But even so, I more or less put everything back in the same places. Styling that many shelves is a lot of work!